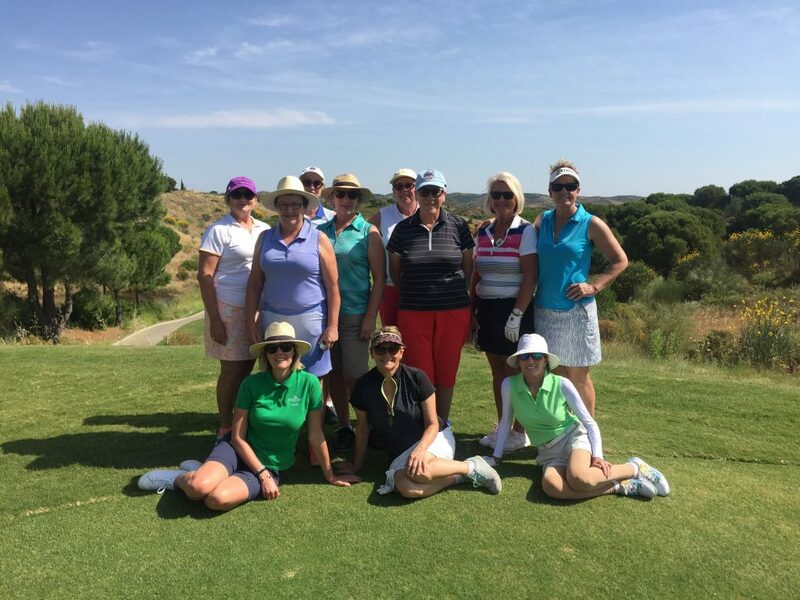 This was officially the first day of our Portugal & Spain Ladies Golf Holiday, but many of the ladies that joined us from around Australia and the US chose to arrive into Lisbon early. This gave them some time to settle in and explore at their own pace. 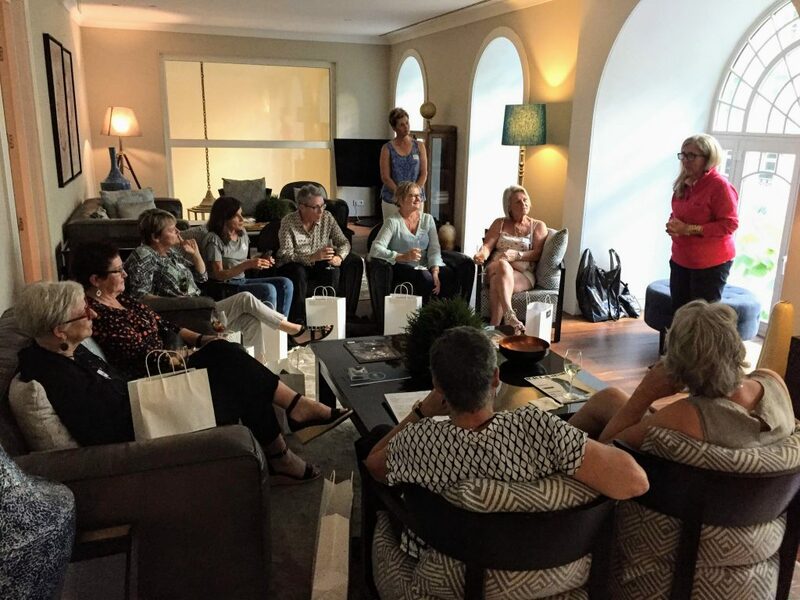 By 6:30pm on 12th June all of our guests had checked in to our luxurious base for the first leg of the tour, the 5 star Hotel PortoBay Liberdade in the heart of gorgeous Lisbon. 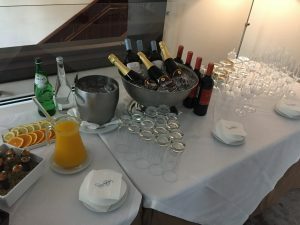 The Portugal & Spain Ladies Golf Holiday kicked off with a beautiful Welcome Drinks and Canapes function in one of the hotel’s private lounges. Fresh sangria’s were made to order and the conversation flowed. Each of our tours starts with a similar function, as it’s a great way for everyone to get to know each other before we hit the golf course. 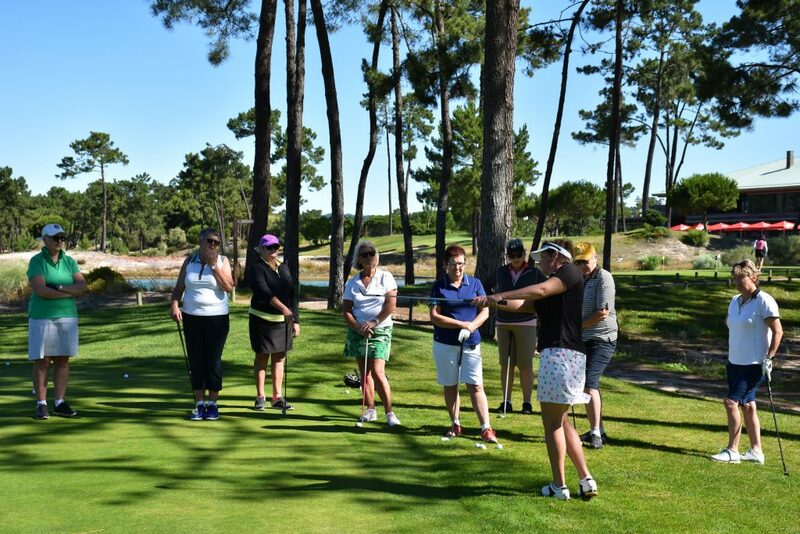 It’s also an opportunity for our Hosts to speak to the group about what they can expect to enjoy over the course of the Ladies Golf Holiday. We had Dicas, a local Lisboeta talk to us about life in Lisbon and she gave us some great tips on areas to eat, shop and drink during our stay. Our visit to Lisbon coincided with the Festas de Lisboa (Festival of Lisbon) and the Marchas Populares Parade. We finished our drinks and spilled outside to mix with the locals and watch the parade. The dancers sing and march in the parade along the Avenida da Liberdade in colourful costumes. Lisbon’s traditional neighbourhoods compete against each other to show off their best choreographed dances and costumes. Originally the site of a 14th century monastery and soon after a retreat for the Portuguese royal family, Penha Longa is situated in the hills near Sintra. The 27 hole course is part of the Ritz Carlton resort. Our tour’s first round of golf started with a golf clinic with our Golf Professional Host, Tiffany Mika. Tiffany began the clinic on the Driving Range, demonstrating warm up techniques and helping everyone with their full swing. It can be hard to concentrate with the beauty of the mist shrouded mountains vying for your attention, but we managed. 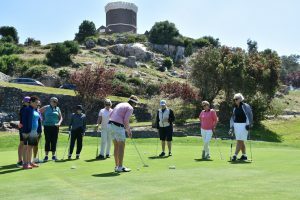 Our golf clinic concluded on the putting green with the ladies receiving some key techniques to implement into their game. We teed off on the championship course, which is beautifully laid out over and around hills, lakes, and 14th century ruins. The winds on the day proved a challenge, but the elevation changes, and stunning views were our reward. The highlight of the day was when Kim pitched a chip directly into the hole from 40m out. After a memorable round, it was straight to the clubhouse for a drink before heading back to the hotel. 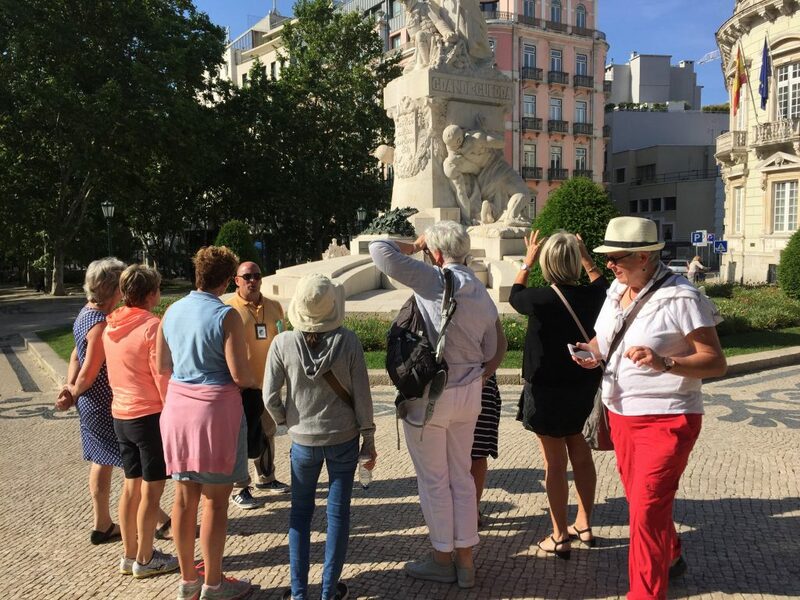 Lisbon is a city of rich history and culture and we enjoyed a wonderful morning with local Lisboeta guide and History Teacher, Daniel who showed us around the ancient Portuguese capital. As we walked, Daniel talked us through the cultural milestones of Lisbon and revealed the hidden stories behind the history of Portugal. 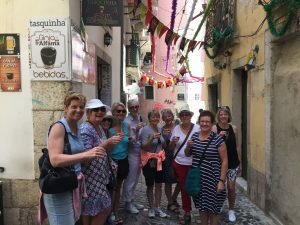 We visited the contemporary city squares, historic city quarters and roamed around the ancient district of Alfama. We were shown a side of Lisbon that we may never have discovered without our guide. It was entertaining and educational tour and helped to deepen our quickly forming love of Lisbon. Leaving Lisbon was hard, but we were excited for the journey to continue. We loaded our luggage and golf clubs into our spacious air-conditioned coach with wi-fi. Crossing the Ponte 25 de Abril Bridge, we left Lisbon and travelled to Setubal where we boarded a car ferry to Troia to cruise across the River Sado. After 30 minutes we arrived at the Troia Golf Club, located on a peninsula running along the Atlantic. After having our golf clubs loaded onto our motorised carts, we headed to the gorgeous practice facilities, for a chipping clinic. After 30 minutes of demonstrations, instruction and practice, we headed to the 1st tee. With the clear waters of the Atlantic Ocean on one side and the pine forest on the other, Troia Golf Club is truly integrated into the landscape. The bunkers were plentiful, as was the sand that was disguising itself as the rough, running alongside almost every fairway. The elevated greens proved a challenge, as they were usually surrounded by more sand. 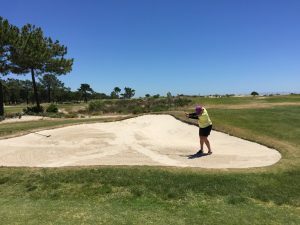 Luckily Kaye has an amazing sand wedge which gets her out of the bunkers first time, every time. After golf we enjoyed lunch in the clubhouse before boarding the bus again and continuing our journey to the 5 star Blue & Green Resort in Vilamoura on the Algarve. After a refreshing sleep it was an early 8am tee time on the South Course at Quinta do Lago. The course starter met us at the club house, had our clubs loaded onto our named carts, and lead us down to the 10th Tee, where he saw us all tee off. The course allowed us to play as part of the members tee times, which was wonderful. The back 9 were all gorgeous, with huge undulating fairways and greens that ran like glass. 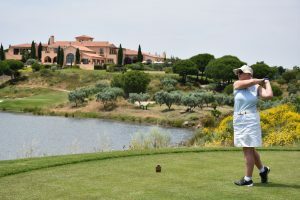 The South Course is set among umbrella pines, lakes and wild flowers, overlooking the serene Ria Formosa National Park. Only one hole had us teeing off over water that was teeming with baby turtles, and Mary played a well earnt par on that hole. 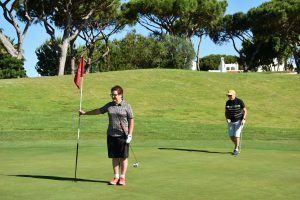 The South Course has hosted the Portuguese Open eight times and we all found accurate tee shots were essential for reaching the greens, as the doglegs and strategically located hazards increased the challenge of the course. Mitch had a great round, taking out the NTP on the 7th. The absolutely magnificent Portuguese mansions lining the course were a spectacular sight when our eyes weren’t glued to the course. 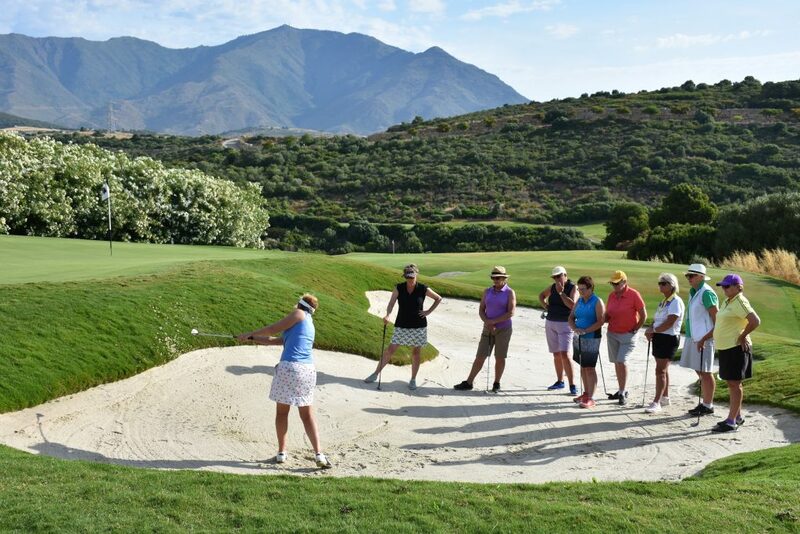 On a G&T Ladies Golf Holiday we always ensure that we do more than just play beautiful golf courses. 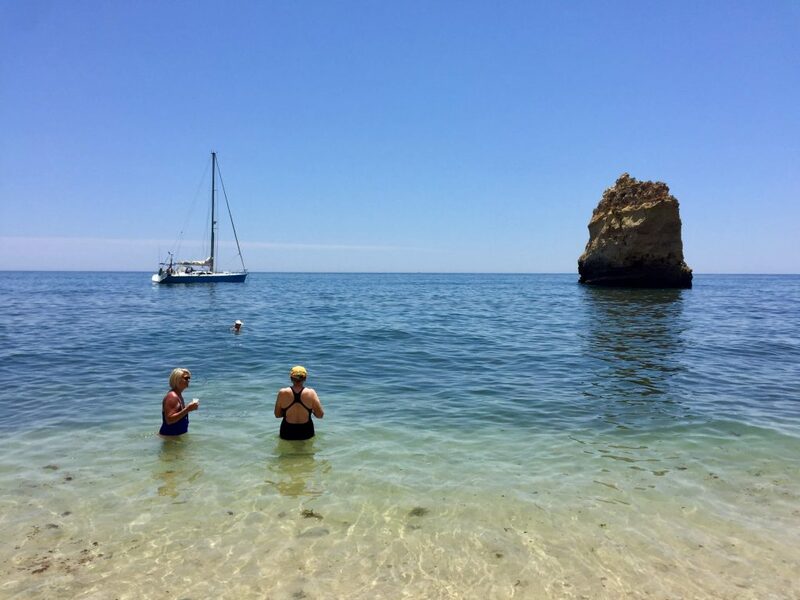 The Algarve Coastline is some of the most beautiful in Portugal, so we transferred to the Albufeira Marina where we boarded the yacht Finismar. The crew were friendly and knowledgeable and helped us get settled as we sailed out of the harbour and onto the clear waters of the Atlantic. 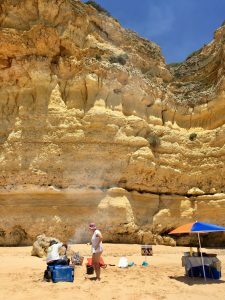 Sailing along the coastline, we passed beautiful cliffs, caves and sandy beaches of the Algarve. The ladies were very attentive as Deck Hand Riccardo took his shirt off and informed us about the local history of the coast. We dropped anchor at an isolated beach, where we could relax and soak up the sun as our BBQ lunch was prepared for us. Riccardo did a great job with the salad. It was also wonderful when he went for a swim and dived under the water, bobbing up like a sleek seal, and flicking his long sun kissed hair off his face. It was unbelievably relaxing, swimming in the clear waters of the Atlantic, watching Riccardo. Unfortunately, all good things must come to an end, and we boarded the yacht for our leisurely cruise back down the Algarve to the Marina. Thankfully, the Captain needed a buoy collected, so Riccardo had to dive off the bow to retrieve it, swimming back to the boat with the buoy in his mouth. A lovely end to the day. Feeling refreshed after our rest day, we left the hotel at 8:45am and headed south to Portugal’s No. 1 Golf Club, Monte Rei. On arrival our golf clubs were whisked from the bus and placed on our carts as we were shown to the 1st tee by the Starter. The Jack Nicklaus Signature Golf Course, is in a private estate spanning over 1,000 acres of unspoilt countryside with dramatic views of the Serra do Caldeirão Mountains and Atlantic Ocean. The level of service and the attention to detail on the course was fantastic. There were lots of sculpted bunkers that kept us challenged and entertained. The gardens and the landscaping was authentically Portuguese. It was a great course for Rose to hit her signature long drives. Tiff, our Golf Professional host floated between the groups giving demonstrations and offering tips and instruction. At the end of the round we were met on the 18th green and escorted to the clubhouse, where we enjoyed a 4 course tapas lunch on the verandah. After 4 nights on the Algarve it was time to continue our Ladies Golf Holiday to Spain. As we crossed the border, we passed orange groves, olive trees, vineyards and fields of Sunflowers. Pencil pines and pink Oleander lined the roads. 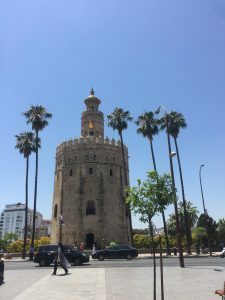 We stopped to explore Seville, a city filled with UNESCO World Heritage sites, Gothic architecture and bustling tapas bars. Everyone wandered off in different directions to explore at their own pace. 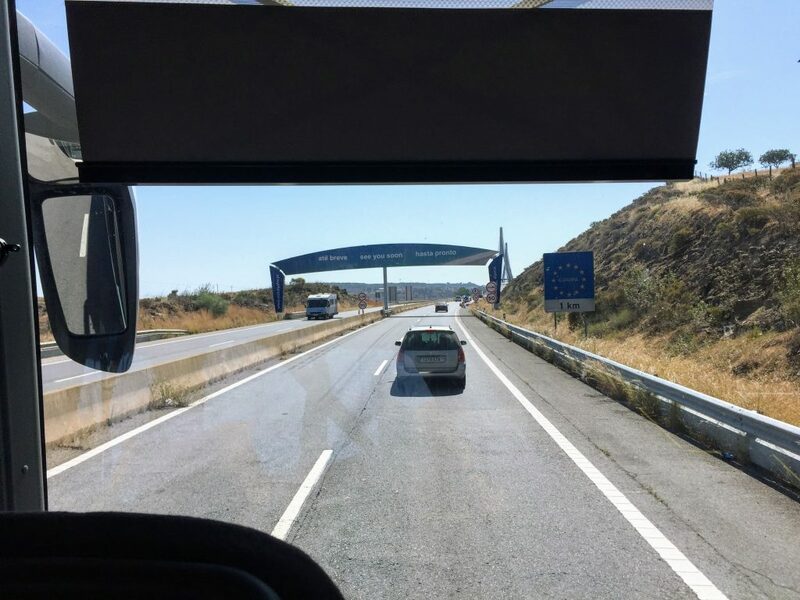 After a couple of hours we all reunited back at the bus for the final leg to Marbella and the sandy beaches of the Mediterranean. 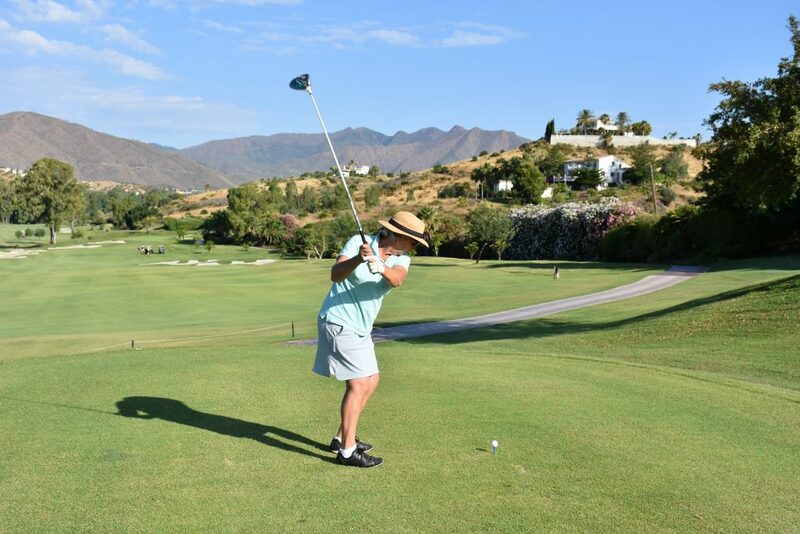 Marbella’s natural setting is perfect for having fun on and off the golf course. Sheltered by the beautiful Sierra Blanca mountains and hugged by the Mediterranean. Long before Marbella starting luring golfers it was home to Phoenicians, Visigoths, Romans and Moors. Its cute casco antiguo (old town) is replete with narrow lanes and well-tended flower boxes. Lots to explore when we’re not on the golf course. 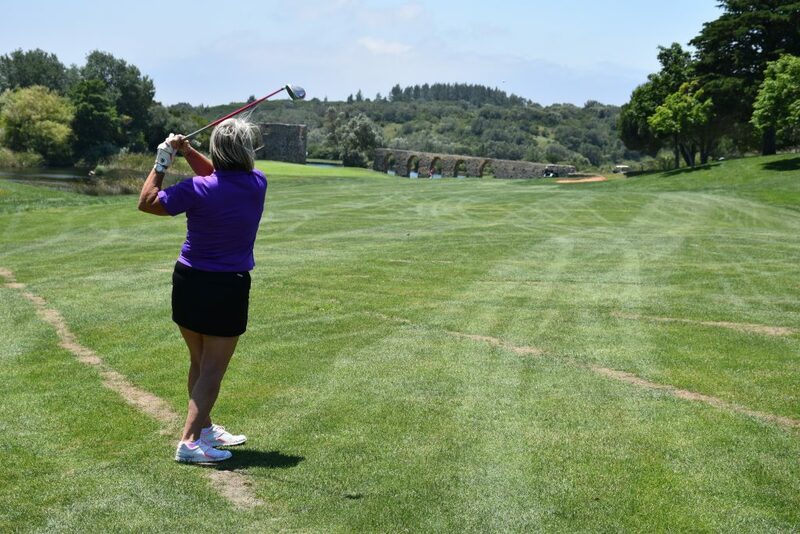 Set just inland from the Mediterranean Coast, on a former orange and avocado farm is one of the most beautiful courses on the Costa Del Sol, Santana. The gently rolling landscape, with perfectly manicured greens and surrounding gardens was an absolute joy to play. 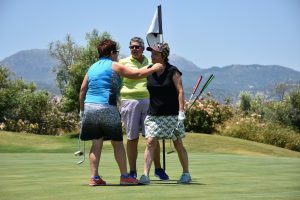 The course has breathtaking views of the Mijas mountains, but these didn’t distract Kim, who once again took out the NTP. The greens and fairways were wide and undulating and those that ended up in the bunkers discovered they were filled with crushed marble. Mary had a great day, sinking a few of her signature long putts. After our round we made our way to the Clubhouse and restaurant for lunch, where the Club’s owner, Laurie introduced himself and bought us all a drink. With the lovely long days, there was plenty of sunshine left to enjoy when we returned back to the gorgeous 5 star hotel. Everyone headed off to enjoy it in their preferred way. Arriving at Finca Cortesin we could see immediately why this club is ranked in the top 5 courses in Spain. We were met at the bus by some of the friendliest and most accommodating staff yet (and they had all been amazing!). Our clubs were once again whisked away and we were shown to the Locker Rooms and Pro Shop. Walking through the clubhouse to the Driving Range, you are met by the most spectacular view of the Driving Range. We started the day with a fabulous Bunker Clinic by our host, followed by a full swing clinic at the amazing driving range. We were shown to the first tee where the starter helped to get us underway. Finca Cortesin hosted the Volvo World Match Play Championship in 2009, 2011 & 2012 and Sergio Garcia compared the greens with those at Augusta National for their quality and speed when he played there. I think our ladies would agree. It was a challenging course, which required strategic thinking and precision to avoid the 100 bunkers. The motorised carts included a call button for the drinks cart, which helped ease the load. As did the complimentary fruit, cold water and chilled towel service as we played. A highlight was being served chilled gazpacho as we made our way around the spectacular course. Surely an ultimate Spanish golf experience! Kim and Maxine both played amazing rounds of golf, and took out the day’s competition. After golf we all enjoyed a few Tinto de Verano’s on the verandah before heading back to our lovely beachfront Hotel Fuerte Marbella. 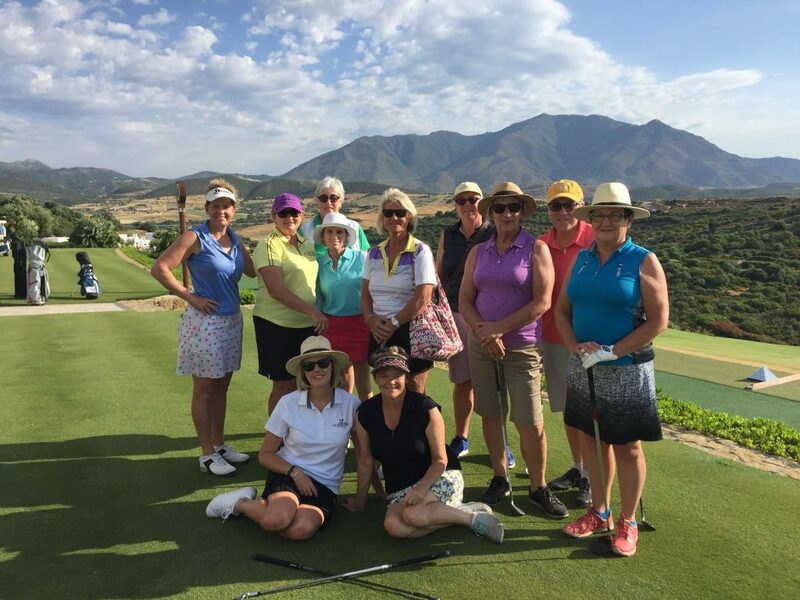 Malaga is just a short trip from Marbella and as it boasts some of the most significant cultural buildings and heritages in Europe, it was an absolute must to visit on our Ladies Golf Holiday. 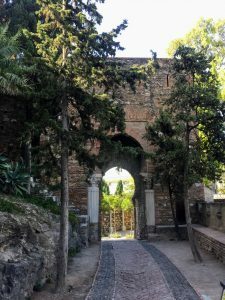 We were met from the bus by our local guide Rocio, who took us on a walking tour of the hilltop Citadel of the Alcazaba of Malaga. It was built by the Hammudid dynasty in the early 11th century. It is a hilltop Moorish-style medieval fortress overlooking the sea, with lush, fountain-filled gardens. From here we visited the ancient Roman Theatre, which despite being built in the first century AD, is still in use as a theatre today. A short walk away was the city’s soaring Renaissance cathedral, nicknamed La Manquita (“one-armed lady”) because one of its towers was curiously left unbuilt. The 16th Century Roman Catholic Cathedral was built on the site of an early Almohad Mosque. Pablo Picasso was born in Malaga, so a visit to the Picasso Museum here is a must. Housed the centre of the old town, in a restored 16th Century palace is a collection of over 285 works by Pablo Picasso. Our guide walked us through the gallery, and Picasso’s history explaining his works and styles. From here Rocio left us, and everyone went separate ways to explore the Malaga’s Old Town at their own pace and in their own way. 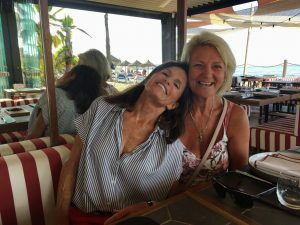 With many intriguing barrios with weaving lanes lined with designer shops, cafes and tapas restaurants there were many ways to spend a couple of hours before we returned to Marbella. That evening we met at the beachfront restaurant Soleo for our Farewell dinner. Champagne was poured and the drinks flowed as we all dined together one last time on this Ladies Golf Holiday. 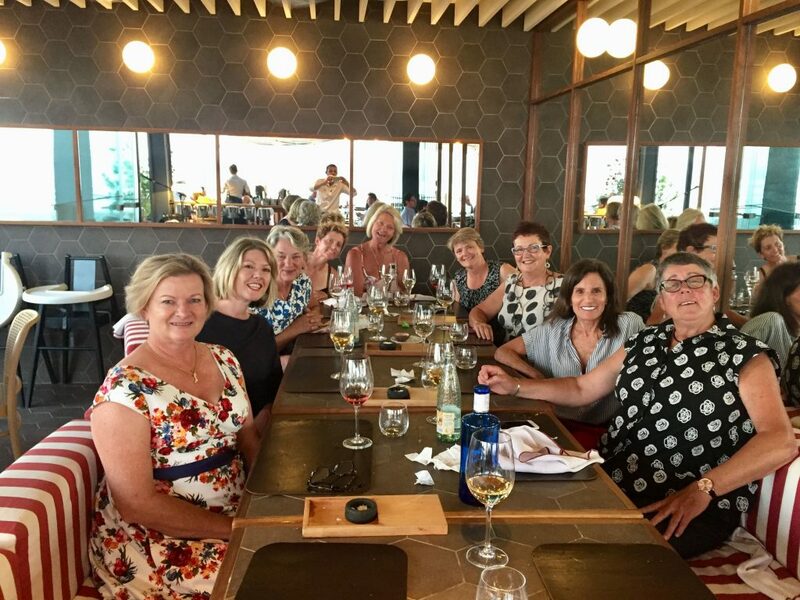 We were privileged to have an amazing group of ladies on this tour that came from all over to spend 12 days with us in Portugal & Spain. We met with one thing in common, our love of golf, and we left as friends with shared experiences and memories. 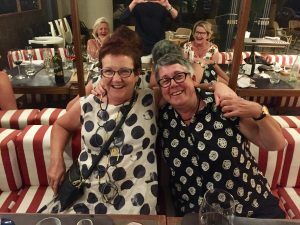 As the tour officially ended, the ladies on our Ladies Golf Holiday departed for all corners of the globe. Some continued their travels on to Granada, Seville, Barcelona and London. Some returned to California, Perth and Sydney. Thank you to everyone who joined us and made this tour as fun and enjoyable as it was. We hope to see you all again soon!